Our courses are designed to enable beginners to advanced speakers become con dent and effective users of English. Our courses are designed to enable beginners to advanced speakers to become confident and effective users of English. Let our training programs help you gain an edge in workplace and professional settings and strengthen the skills-base of your organization. AMIDEAST assists individuals and institutions in assessing skills and taking a wide range of language, aptitude, achievement, and professional qualifying exams. Find out everything you need to know about pursuing your education in the USA at our advising center. Whether you are a graduate, undergraduate, or a professional, we can guide you. AMIDEAST supports numerous scholarship programs for Moroccans from high school age and younger through graduate studies. We partner with NGOs, government agencies, and international development donors to design and implement institutional strengthening programs. AMIDEAST has worked to expand educational and training opportunities in Morocco since 1979. This 40-year legacy has enabled tens of thousands of Moroccan students and professionals to access opportunities and better their lives. AMIDEAST has facilitated increased academic, business, and cultural exchanges with the United States through scholarships, educational advising, and English language and professional skills training. 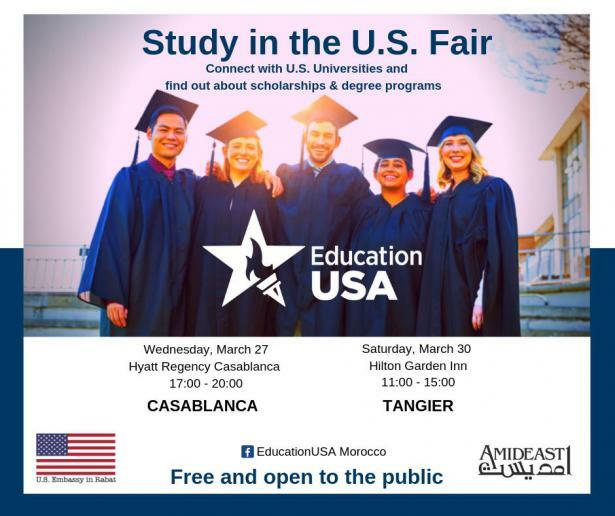 Since 2007, AMIDEAST has also welcomed over 2,000 American high school and university students to Morocco to study Arabic, French, and other content courses. AMIDEAST currently has offices in Rabat and Casablanca as well as manages skills training programs for OCP (Office chérifien des phosphates) and the Foundation Phosboucraa in Khouribga, Ben Guerir, Laayoune, and Dakhla.